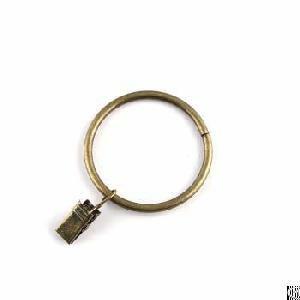 - iron drapery rings are made of strong metal with strong tension clips and they are easy and convenient to use. Best Finish - decorative and made of premium metal finished with a durable plating for long lasting. Smooth Sliding - Simply slide the curtain round rings onto your rod and attach drapery, this is the best way to hang your curtains so they remain in place. Packing: 1. 500 pc bulked in opp bag. 2. several pieces per small opp bag. 3. can be packed as customers' require. Shipping: by DHL, UPS, FEDEX, TNT. Shipping time: generally 5-7 days. 2) we can adjust size and plate colors flexibility by ourselves. 3) we can provide flexible packing options as customer' require.